In honor of Make a Difference Day, the seventh grade worked together to make a quilt. The theme for the quilt is Peace Through Service. Each seventh grade student designed a quilt square showing an act of service in our community (reading to a younger child, recycling, working in the Childrens Garden, etc.). The students worked to complete this project in Advisory class during the week of October 22-27. The finished quilt will be auctioned off during the Empty Bowls dinner, and proceeds will be given to a charity of the seventh grades choice. 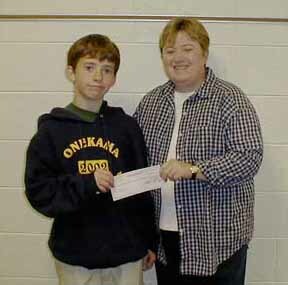 Nicholas Schmoke, Seventh Grade Class President, presents Toni Krueger, Manistee County Humane Society President, with a donation raised by Onekama students. In honor of "Make a Difference Day," seventh grade students at Onekama Consolidated Schools worked together to make a quilt with the theme "Peace Through Service." With guidance and assistance from advisory teachers Mrs. Megan McCarthy and Ms. Gretchen Eichberger, as well as many community volunteers, each seventh grade student designed and constructed a quilt square showing an act of service in our community such as: reading to a younger child, recycling, or working in the Childrens Garden. 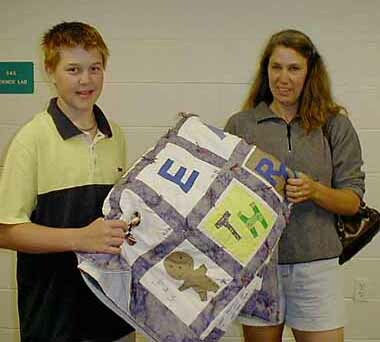 Following the completion of the quilt, a raffle was held to benefit the Manistee County Humane Society.